Innovative product, adaptable to any age and ability level. 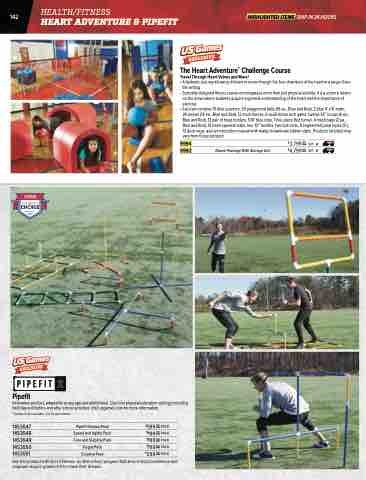 Use it for physical education settings including field day and before and after school activities. Visit usgames.com for more information. *Variety of sets available. Call for pack details. Use this product with Xcel 2 Fitness- an after school program that aims to build confidence and empower boys in grades 3-5 to chase their dreams. Travel Through Heart Valves and More! 24 arrows (12 ea., Blue and Red), 12 multi-domes, 6 multi-dome arch gates, twelve 36” hoops (6 ea., Blue and Red), 12 pair of hoop holders, 100’ blue rope, 1 five-piece Red tunnel, 4 mesh bags (2 ea., Blue and Red), 15 heart squeesh balls, four 12” hurdles, two ball carts, 8 segmented jump ropes (9’), 12 deck rings, and an instruction manual with ready-to-laminate station signs..Products included may vary from those pictured.